Do you know? After getting Google AdSense account approval, there is a lot of things for earn better money with reliability. In which one aspect is known as ad placement but most of blogger are not aware about its accurate knowledge and how they can place his Google AdSense ads on right places, where they can get maximum hits from his visitors. Now I’m here to show you, Google AdSense heat map guide for beginners, which will help you to place your AdSense ads on perfect places to generate lot of revenue. Firstly you need to know about heat map, heat map indicate the best places on website with highlighted areas. Google AdSense team also revealed his heat map, in which they showed the most prominent areas on website, which are considered as best ad placement areas from advertisers and publishers perspective. 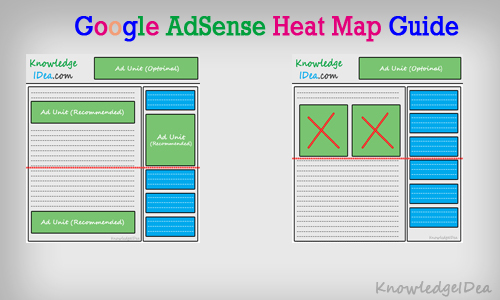 Google AdSense team provides heat map for user convenience and for better understanding. Now I’m going to reveal and elaborate this heat map and its aspects. Let’s see. 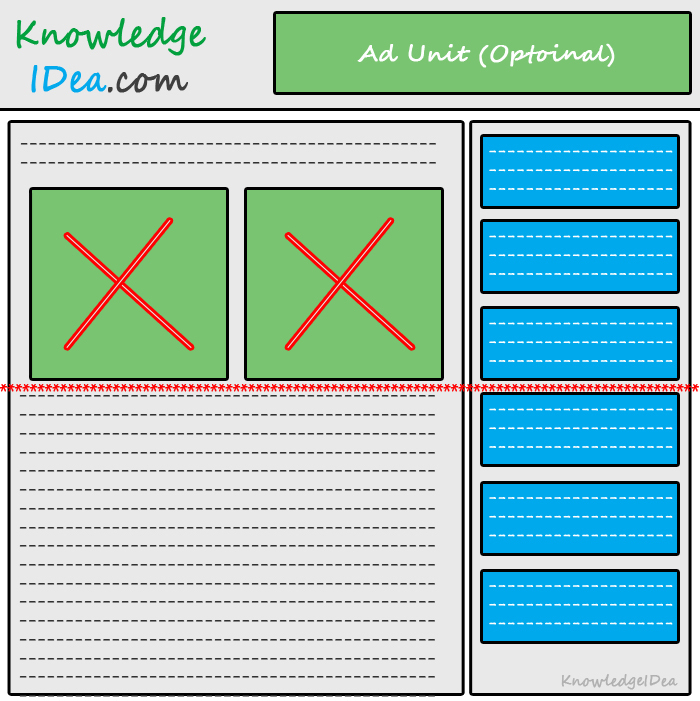 Above given heat map showing the recommended and optional places, highlight recommended ad units in the above heat map is a perfect places for ad placement. You noticed, we marked a red dotted line in the center of this heat map, above the red line area known as above the fold and below the red line area known as below the fold. 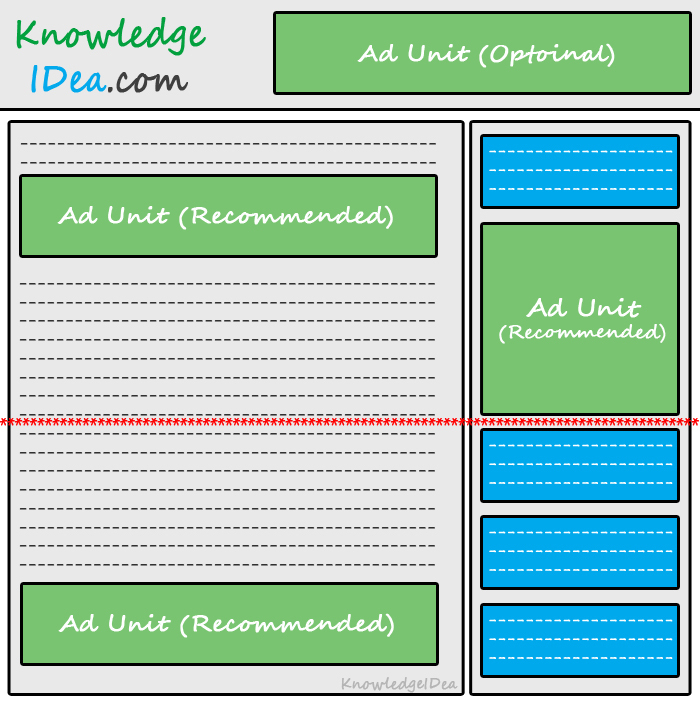 Do not put excessive ads above the fold area, because excessive ads above the fold shows your interest in ads instead of website content. Let take a look poor ad placement heat map. Above heat map showing poor ad placement, often bloggers gives preference to his ads instead of website content, that’s why they push the precious content below the fold. Google AdSense never like that kind of reaction, they recommend maximum content should be appear above the fold same like first one heat heap of this post. Your ads should be close to your content, for which user are interested. You need to customize your AdSense ads links and colors according to your requirement or brand colors, ads should look like a part of your website content.